Breeding pairs are formed when the birds reach about 2-3 years of age, these bonds may be life-long, but polygyny may occur. 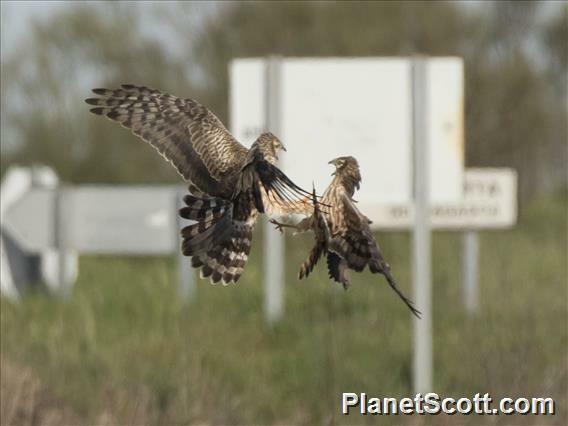 This species performs elaborate courtship rituals, similar to those of the marsh harrier. The pair circle together at great heights, may pass food to each other, and roll or tumble together, often with talons outstretched. Egg-laying occurs between May and June. The female constructs nests on the ground from grass and sticks. 4 or 5 eggs are laid, and incubation takes about 40 days. After a further 42 days or so the young birds fledge (2). Hunting behaviour is similar to that of the Marsh harrier, and involves slow back and forth flight close to the ground. When prey is located the bird suddenly drops onto the quarry, with talons outstretched. Prey species include small mammals and ground birds, reptiles and invertebrates (2).